I have WHMCS licence. Is there have any whm/cPanle alternative free/opensource panel which I in interrogate with my WHMCS? My goal is install a free panel on vps and then interrogate that server to WHMCS for automation. as stated above the only other material you could use is ISPConfig other then that i dont believe there is. Easy would be just to open the drop-down in the Products tab and just take one and search via google. 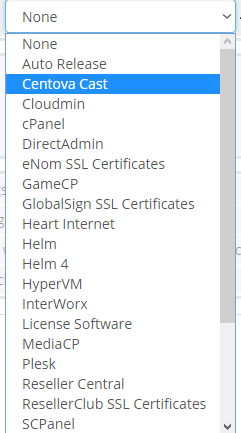 One which is free and not in the List would be http://centos-webpanel.com so far you using CentOs as OS. VestsaCP has its own module also I believe. Point is just find a control panel you like and see if they have a module for WHMCS of their own. The most reliable cpanel alternatives I have used that are free are Ispcomfig and Virtualmin. I am currently using Virtualmin, CWP, and Cyberpanel. Virtualmin is extremely complicated to use but by far the most feature rich for GUI use, CWP and Cyberpanel have much nicer interfaces (particularly for client/user dashboard). If you want top notch support and reliability...definitely ISPConfig. However setting up a server to use it is a marathon...it's frustratingly slow to configure anything on Ispconfig...but once setup and fine tuned, a very reliable panel. Has no file manager! If you need file manager, maturity and stability, Virtualmin 100% (virtualmin docs and support aren't the best though...not terrible, but forums support for "virtualmin-gpl" free version could be a lot better than it is.) Virtualmin is a massive learning curve...its a very powerful control panel and its dashboard needs a street directory to find things! If you want free, stable, maturity and reliability, functionality, and provide shared hosting for clients, however have clients who are willing to put up with its somewhat disjointed interface design...out of all the free panels, virtualmin is "by far" the safest option. I cannot understate how big of a learning curve it is though. Also, if you start messing around with virtualmin defaults without 100% knowing what you are doing...you will destroy it and have to wipe the server and start again. I have been using it for 2 years and have done that many times. Also, if you start messing around with virtualmin defaults without 100% knowing what you are doing...you will destroy it and have to wipe the server and start again. I have been using it for 2 years and have done that many times. Are you using litespeed server? or is it possible to configure with openlitespeed with Virtualmin? There has been some discussion on the virtualmin community about openlightspeed integration. I read that someone has done it, however as far as I am aware it's not a drop in replacement in virtualmin like nginx is (requires some manual configuring). Apparently virtualmin ran a bit of an internal poll a number of years ago and the consensus was that more people wanted nginx...so openlightspeed was dumped off the to do list at the time. I am not sure if there are now plans to reverse that decision, although the community has rumblings asking for openlightspeed integration. In answer to your second question...I would have to check to remind myself...I don't use it, however one of the webpanels I use I thought had an option for that...I think it was the Virtualmin one. Off-topic...one thing I am starting to believe about ispconfig, it's quite manual in a lot of ways, however I think it teaches a much deeper understanding of ones webserver than virtualmin or cwp or Cyberpanel. So when things go wrong, I have a lot more faith in them being fixable on Ispconfig.